Avon Material Supplies (AMS) provide skip hire to businesses and individuals in Dorset for the disposal of construction and demolition waste. Skip hire is available Monday to Saturday in all BH postcodes including Bournemouth, Poole and Wimborne. We also provide skips for other waste types including; mixed household, commercial & industrial, plasterboard, wood, garden / green and inert. Please note, construction waste skips cannot be used to dispose of electrical items, liquid waste or hazardous materials, such as; aerosols, gas bottles, pesticides or TVs. Plasterboard waste is also not permitted in mixed waste skips because by law it must be disposed of separately. Please contact us if you need more information on what you can dispose of. Construction and demolition waste is more tricky to recycle due to the different types of materials being combined together for disposal. 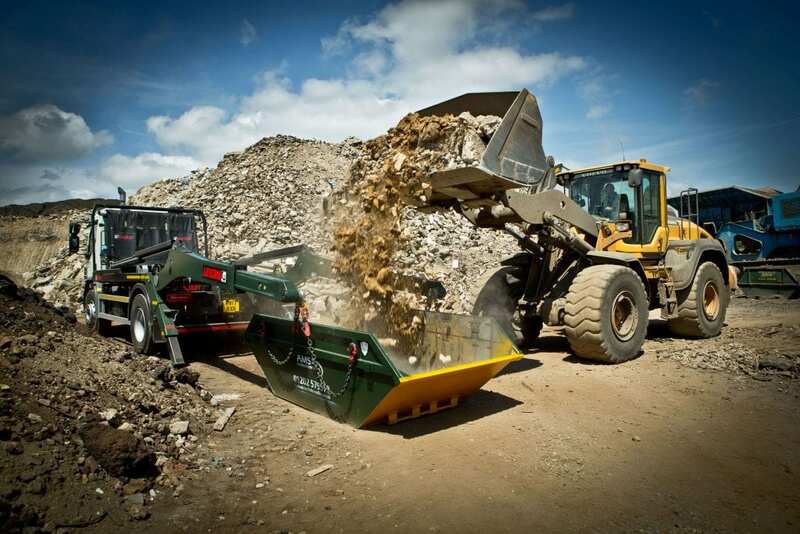 To increase the volume of waste that is recovered and recycled, construction waste placed in our skips is tipped at a local recycling facility, such as Canford Recycling Centre. To further aid our clients with recycling, AMS are able to offer single waste stream skips for the disposal of mixed household, commercial & industrial, plasterboard, wood, garden / green and inert wastes. We offer three different sizes of skip for the disposal of waste, our smallest skip is 6 yards, you should expect to be able to fill this skip with the equivalent of around 60 bin bags. Our medium sized skip is 8 yards, holding the equivalent of 80 bin bags. Our larger skip is 12 yards and will dispose the equivalent of 120 bin bags. Please note, these figures are estimations and meant for guidance only. If you’re unsure which skip size would suit your construction waste the best, please call our expert team on 01202 579579 . What is the cost of skip hire for construction waste? Our skip hire prices are competitive and are regularly reviewed to help ensure we stay ahead of our competitors. To receive the best prices we encourage all our clients to call us on 01202 579579. Whatever the amount of construction waste you have, AMS have the answer, whether it’s a 6, 8 yard or 12 yard skip, rollonoff container, grab lorry or skip bag. Discuss your needs with our experts on 01202 579579.